You can tell an election is coming ! The issue has been talked up by the doctors union at the last three elections. Each time all the political parties have run away shouting the sacrosanct mantra “the NHS should be free at the point of delivery”. I am far from convinced that charging is a good idea, BUT, something has to change. More and more GP’s are retiring early. Many practices are unable to recruit new doctors. Some practices are closing altogether. New patients can’t easily get registered. Appointments can be difficult to get quickly. Being not able to see your GP often means more people turn up at A&E. If they are elderly and are admitted, they often don’t come out quickly. Gradually the whole system clogs up. Underlying this situation is the dramatic growth in the older population and the high levels of chronic illness in the older age group. Nobody wants to face up to this situation, but the G P’s can’t avoid it — unless they retire ! It has been suggested that they try a few limited pilots of charging, with exemptions for those people on welfare benefits or recurrent illness. You can see this would be controversial straight away. 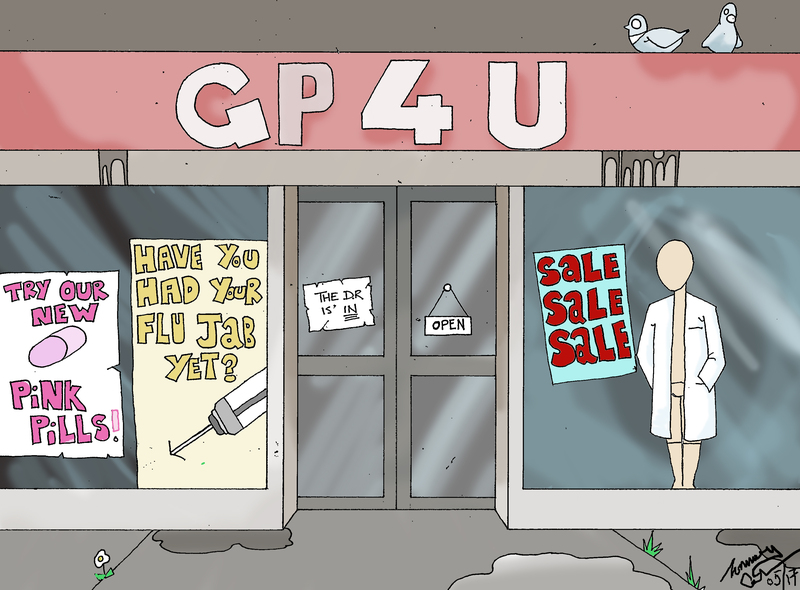 I would open some high street shops as walk-in centres manned by GP’s and nurses. Open nine till five seven days a week, they would charge a standard £25 for a consultation and more if treatment was subsequently provided. If you didn’t want to pay for treatment, you would be referred to the NHS and join the waiting list. This should reduce the pressure on GP services. Could be the start of a new era in health care with a focus on well-being and healthy living. This entry was posted in N.H.S. and tagged Gp. Bookmark the permalink. 3 Responses to G.P.’s Charging Fees. Dear John, this is my response to your heart warming article on the subject of payment for a visit as a UK National to the Local GP, within the National Health Service. I offer a caveat before I proceed, and wish to state that any foreign national, regardless of entry into the UK and who chooses to be consulted/examined, by a NHS doctor pays the token charges levied, regardless, unless they chose to use the or a private health service. I believe we have to completely review the national health service, with radical thoughts in mind, and a positive attitude, and detach the medical/mental/dental requirements from the social care and welfare attributes completely, and make the men and women in grey suits in Whitehall explain in plain English, the subtle differences and why they are considered as one package. Money is mentioned by you John, and modest costs are thrown around, but who pays and who does not? Is not clear? For a simple GP’s service. My generation have paid through their working life, or being subject to a ‘NATIONAL INSURANCE TAX’, here’s the rub, the concept is genuine, and the social ideals wonderful, but by the connivance and convenience of ‘Collective Taxation’ bastardised and miss used and miss appropriated by Whitehall Government Departments, and inept Politicians without a backbone between them? [Difficult to prove], but at my age of 74, I am now being asked to, after a life time of paying national Insurance to again after retirement to further pay towards the National Health Service! I wish to shout ‘foul’!! I sincerely believe we should dissect the NHS carefully, and intelligently without emotion, and consider what the concept of the National Health Service is for? All these with the exception of sight, and dental care should as now be paid for or a contribution paid for by persons over the age of 21 (Why? at 21 most modern children are in education or apprenticeships, or low earning work placements). At the age of 21 the state system/government should have prepared their bodily well-being for the adult work place? Here if one objects I believe we should isolate the need for care from the pure National Health Budget, and any of these care charges for looking after should be sought from if required with a means test from the actual personages concerned. I have no express views on a Private Health care system/practice, as those who are rich in assets have always utilised the ‘private sector of the NATIONAL HEALTH’, either as individuals or us through work related incidents/insurance cover, and to some extent private insurance schemes. What I elude to from my industrial experience in life is a local/county/city/town health mutual insurance cover scheme to which we all of all ages contribute, and a re-insurance national –Insurance Health provision in the UK, to help iron out local deficiencies, and uncertainties of financial backing due to the local indigenous population, in total-(working and non-working-of all ages). 5	In centres of health excellence the cost of health surgical machines and equipment, for the benefit of wellbeing and health of the patient. [E.g. Fitting out of operating theatres]. 6	The cost for accident and emergency cover (Para medic and ambulance services, and the training of purely paramedic staff. 7	The fight against infectious diseases and epidemics. 10	Psychiatry and mental health. C	The training of all non-medical support staff/administrators/clerks/ cleaners/porters, etc. D	Development new research treatments, such as Mobility and mental health problems in the elderly population. What I respectfully suggest is that the mutual fund 1-7 [and included 8-9 -10 for those under 21 years of age] above is subject to a levy/charge by all over the age of 21, based on the average costings per person of the population, and paid for life- but means tested, with respect to cash and property held assets, by that person throughout their life? With a moratorium of the past 20 year’s record of assets/cash held by that individual or family. For psychiatric problems the truth still holds- Problems related to self- administered (commonly called illegal drugs), this should be funded as for the re=insurance Insurance income- general/central taxation fund. With respect to the re=insurance Insurance Fund A-D above, I respectfully suggests this comes from the central, taxation purse, but held in a non, cross subsidy account? I.e. fit for purpose. What we may have to do is to remove the ‘CARE packages’ from the National Health Service, carefully without emotion, and if care is required in any form charges as a ‘Taxation’ payable by all working aged persons, with some realistic ‘means tests’ so that all those who may have paid the full taxation package and ‘National Insurance’ during a lifetime at work, are acknowledged to have in their retirement after the nominal age of retirement some financial credit in the existing or future National Insurance scheme, or its sucessor. I need and require just 2 minutes to adjust, and acknowledge the events of Mondays bombing in the city of Manchester earlier this week in May 2017. I must pause as has the nation and the politicians with their electioneering campaigns to question this nation of ours? Intolerance of others, in creed, colour and religion, make me as a family man of a certain age, question quite seriously, was I to blame? Am I intolerant, bigoted, and misinformed, would my children and their offspring be prepared, to commit suicide for a cause which I find difficult to understand, and yet in British Society in general we have had the do gooders’, and political correct brigade broadcast and express the message TOLLERANCE through the 70’s 80’s 90’s and into this century. I humbly question what have I learnt from this event in Manchester, and the desecration of young lives for ‘’what’’ I may ask? World history has shown me and my parents’ generation, the ‘’Holocaust’’ in Germany in the 1930, to 1945, the Japanese’s Intolerance towards their society in the 1930’s and the Second World War, Our parent’s generation fought and died for equality of life for all!! In the UK, and Great Britain we have had the good and the political correct brigade persecute the river of blood speech, by Enoch Powel, and their views on racism, and colour, and creed, very little on freedom of on religious beliefs, and how the elders of a religious order, foreign and native to Great Britain, should behave and guide its flock with the ideals of freedom to follow the beliefs of their choosing? I do not think one can throw stones at our forbearers for their lack of thought or understanding of this great world in which we live. We all are responsible, but the terrors of a world of misunderstanding and bigotry worry me, and how a younger generation of UK citizens can turn against our society, and especially the young in our society, blaspheme and commit genocide should in my humble belief be wary of the society in which they live and at present are tolerated? AS world war one and world war two showed us we fought, not only as a nation ( the UK), but as an empire and commonwealth, and I believe those who also shouldered arms and fought alongside us also fought- not through blind allegiance but for survival of their beliefs and their own nation. Hello hello! I see we are back to the political electioneering trial within the UKplc. With respect to the recent events in Manchester, we are being subjected to alleged messages, of miss use and miss appropriation of the world wide web and its ability to spread information/views and intelligence, without responsibility, either socially as a society, or as a ‘’ministry of information’’ tied to some form of –nationalist thought police-[good or bad]. If one gently and quietly reflects on history, we have all been through this hoop, via the ‘’control of the mind’’ philosophies of the ancient churches and religions, of the world? Simply put how the FEW! Control the masses of a social population, in thought word and deed, and too who’s BENEFIT? It is all a learning curve. The modern western world does it by what I know as ‘’democracy’’, and all the problems this may present to its masses and each individual. Education is the answer, and tolerance within each society, and civilisations of this world of ours as we may know it? One thing I have learnt as the older citizen of this world of mine, is experience of a sort, and not to ‘’ASK the Unknown/unasked Question’’ unless one has an idea as to how to answer it with proposals, that are acceptable to the greater body of persons within that society? The web was given to the people of this world, free/gratis by our forefathers developing technology, and they realised information was ‘power’ and belonged to us all, not just one section of society. How do we solve this enigma? The first port of call is information, and how it is rationalised by us all, it is difficult-maybe but by rational thought we all may overcome some of these problems. Firstly can I consider, what are these social sites on the world web? Such as, Twitter, Facebook etc. for example, and I pose the following questions? 1	What is the common language of these social sites? 2	Who or whom are the greater users of these sites (Ethnically speaking)? 3	Are the users using their mother tongue? 4	Is the available information good or evil or socially unacceptable in a common tongue of the social site? 5	With this broad spectrum of power [alleged], how does a civilised world channel such impressionable thoughts and beliefs, into a format that is of benefit to us all, and not the selected few, who do not believe in what I understand as democracy? 6	Is there only one ‘GOD’ for all? Answers on a postcard please? Who is he/she? Are you still a thinking person? Or are you one of those bigoted few? With respect to this Grumbles Smiles website, sometimes the politicians raise issues which affect us all, and one day mine will be selfish, how do I meet my maker with an easy heart, and open mind. Until then I do and ask for the requirements politeness, and respect, with what we oldies have put into this UKplc. Society of ours, and while I fight for my own comforts in old age- to which I believe I am entitled too! Allegedly? I do also worry where I am leading our children, with the vote I have in this society of UKplc. In the forthcoming election.